Hi. 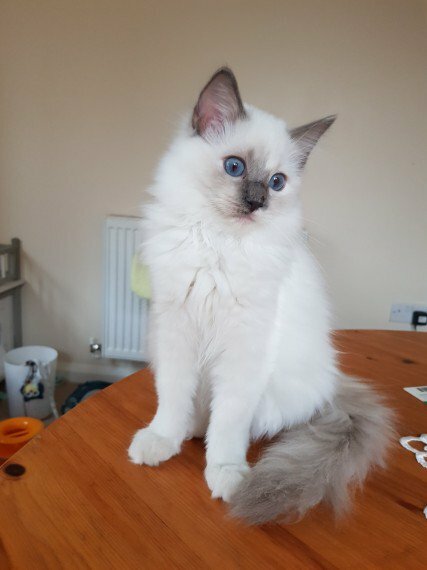 Here in LeCendrillon Ragdolls we have stunning GCCF registered kittens .none active register PET. Le Cendrillon Momo Delightful. Seal biclour lynx boy . reserved Le Cendrillon Sakura Blossom. Seal bicolour tortie girl . reserved Le Cendrillon Toby Skyfall. Seal mitted boy . reserved Le Cendrillon Yuki Diamond. Blue tortie mitted girl age . Available Parents both registered in GCCF on active register with many champions and grand champions in pedigree lines. Yuki is 15 weeks old and ready to go to her new forever home. Yuki has amazing deep blue eyes. strong bone structure and lovely soft coat. Yuki love to play. spend time with her owners and is very friendly and curious kitten. She will go to new home. . 5 Weeks free insurance plan . Fully vaccinated .twice. . Microchipped . Health checked .twice. . Litter and scrach post trained . PKD and HCM free after parents . Food and toy starter pack . Contract . registered as a Pet Only . Need neutering specified in contract. Please be aware that as a certified GCCF breeder we making sure kittens will go to the best possible homes where they will get all the love and attention they need to grow and be happy. Thats why we Never selling our precious babies to .Students and anyone with allergies . if you not sure if you or any other household member is allergic please check it prior coming to our cattery. Keep it mind Ragdolls are Indoor breed only and we do not sell any of our kittens to homes with other outdoor animals. If you have any questions. need more photos or want to schedule viewing please contact us via email or phone provided . we prefer texting over phone calling as it easy to track the conversation.